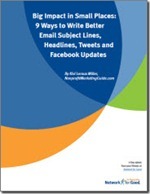 Network for Good has just launched a useful new ebook writtten by nonprofit marketer Kivi Leroux Miller, Big Impact in Small Spaces: 9 Ways to Write Better Email Subject Lines, Headlines, Tweets and Facebook Updates. When you fill in the brief form to request the ebook, you’ll get bonus access to a recorded Nonprofit 911 training webinar, The Final Word on Year-End Fundraising - 5 Things You Can Still Do to Boost Your December Income, plus a transcript and PDF of the slides for the webinar to download. The Nonprofit Research Collaborative has just released released a report on the state of nonprofit fundraising, based on data collected from 2,356 public charities and 163 private foundations who participated in an online end-of-year fundraising survey conducted between October 19 and November 3, 2010. Technically, we’re in a recovery. We are beginning to see some positive signs. But despite that, giving still has a long way to go to return to the levels it was at three or four years ago. You’ll find a good summary of this report highlights at NonprofitTrends, or you can download the full report from Guidestar or the Foundation Center (PDF). The Nonprofit Research Collaborative is a coalition of the Center on Philanthropy at Indiana University, GuideStar USA, the Foundation Center, the Urban Institute’s National Center for Charitable Statistics, the Association of Fundraising Professionals, and Blackbaud. 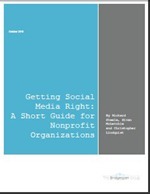 Finally, from Bridgespan comes Getting Social Media Right: A Short Guide for Nonprofit Organizations (download the PDF here). This “evolving but experience-based guide to using social media effectively” was developed with survey input from more than 136 nonprofits, as well as the advice of social media experts such as Beth Kanter and Craig Newmark. The full data set (purged of any identifying information from the contributing nonprofits), survey, and framework are all available for download as well. What new resources have you discovered recently that can help nonprofits learn to communicate and fundraise more effectively? Thanks for these, you might add that Jumo is a nice new and free platform for nonprofits out there as well. I was thinking more of resources in the sense of information, training, research reports, etc., Brian, like the ones mentioned in this post - but thank you for a timely reminder of the beta launch of Jumo. The new social network is certainly getting a lot of mixed reviews right out of the gate, but it is an important landmark for nonprofits, no matter how one may feel individually about the Facebook requirement, fee structure, and so on. Amy Sample Ward has written a great review of Jumo http://amysampleward.org/2010/11/30/first-reflections-on-jumo/ for those interested in learning more, and links to some of the other on-going discussion about this new social network. There's also a really lively discussion going on in the comments thread there, well worth reading for a sense of what others in the sector think of Jumo and how they might use it, or if you're just wondering what Jumo is and what the hubbub's all about! BTW, have you seen the issue around iphone and donations? The petition to Jobs? Hi Beth, thanks for mentioning that. It looks like your link doesn't work for people who aren't on Facebook and/or haven't "friended" you on Facebook, however - perhaps a temporary glitch? Givimo.com is another new social web platform with free nonprofit and activism tools. thanks for sharing all the useful resources.